POCKET WHITTLER TM by Mastercarver® High-Performance Tools! The ultimate wood carvers pocket knife! 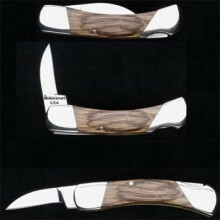 Unlike ordinary pocket knives, the Mastercarver® “Pocket Whittler” is custom designed with the wood carver in mind. The blade is perfectly shaped for better carving & features a razor sharp edge and V-grind for easy re-sharpening. It folds when closed & locks securely when fully opened (will not fold when pulled out of a cut). It utilizes a precisely made, reliable, back lock (or lock back) design. Contoured handle & all contact points are hand polished for smooth operation & extra comfort. Blade features include: custom blade design, V-grind, high-carbon 1095 steel & Rc 61 hardness. Also includes: positive blade lock for safety, nickel silver bolsters & pins plus heavy gauge brass liners & laminated oak wood grips. Sizes: closed 3.75”, open 5.5”, sharpened blade section 1.5”, thickness 3/8”. Click the button below to add the Pocket Whittler Folding Knife to your wish list.